Placed near the lens aperture is, in effect, a concentric graduated ND filter that has the highest light transmission at its center (the opposite of a central ND-type filter). Combined with the lens’s high spherical aberration correction, the APD element is designed to achieve high resolution at the image plane, with smooth foreground and background blur. The darkened edges of the APD element also eliminate the bright-edge effects of out-of-focus highlights. 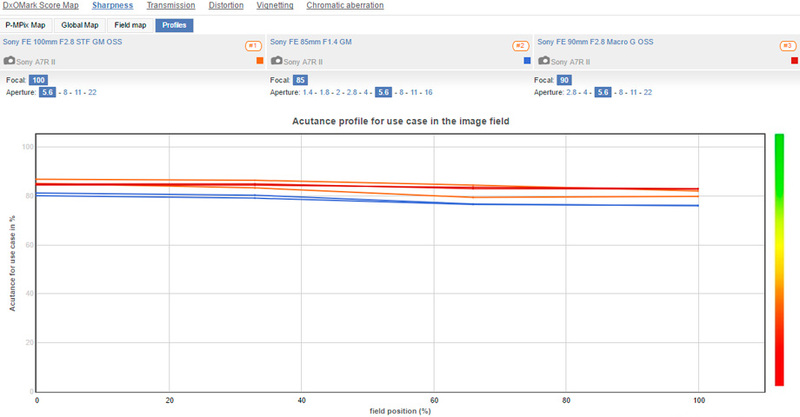 Although not the first lens with an APD element to use AF, the Sony’s low transmission of T5.6 wide-open means it’s less suited to dimly-lit scenes than the F2.8 maximum aperture suggests. Lens construction consists of 14 elements in 11 groups, with one ED element to reduce color fringing and one aspherical element to improve resolution, along with a very useful 57cm minimum focus distance. The lens’s internal focusing system utilizes a fast and near-silent Direct Drive SSM motor to focus down to a minimum 0.8m. It features an 11-bladed circular aperture for rounded specular highlights, a customizable focus-hold button, a dust- and splash-resistant barrel, and Nano AR coating to reduce flare. The lens measures 118mm in length, weighs 700g, and has a 72mm filter-thread. The lens performs very well, with very high sharpness levels, very low vignetting, and just a little pincushion distortion that may be visible in some images with straight edges or parallel lines to the frame. 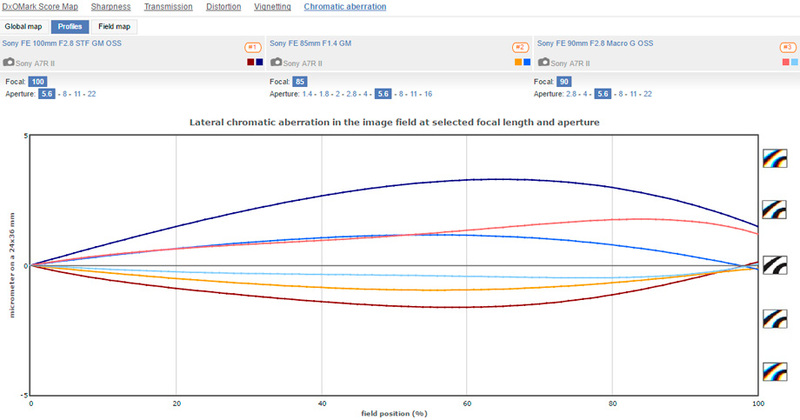 In keeping with modern lenses, lateral chromatic aberration is also very low. 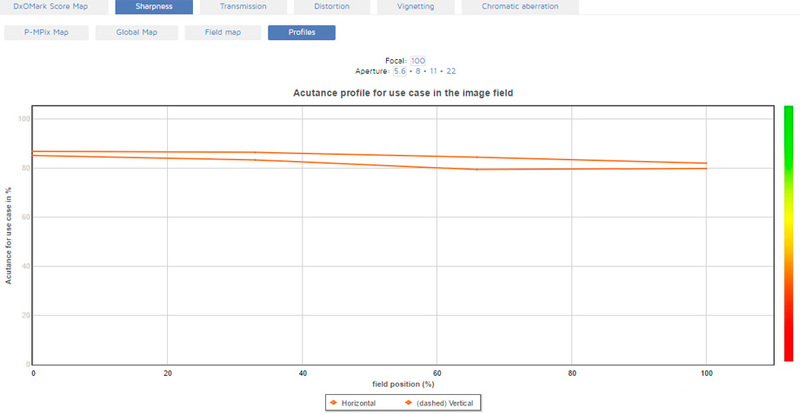 And although this lens is an f/2.8, the aperture ring is marked in T-Stops from T5.6 through to T22, so it’s no surprise to see that the measured transmission is exactly 5.6 TStops. Wide-open (at T5.6), the new Sony 100mm F2.8 STF is exceptionally sharp, with levels in excess of 80% acutance across the field. Stopping down doesn’t really improve sharpness levels — indeed, at T8 (one stop down), there’s more uniform sharpness across the field, but if anything, it’s not quite at the same level in the center. Sharpness falls slightly thereafter at T11 and beyond, but that’s hardly an issue, as it is plenty sharp enough. The lens has some pincushion distortion that is perhaps slightly higher than one might expect, but as this lens is intended for portraiture, this is unlikely to be cause for concern. Vignetting is negligible at –0.5EV in the extreme corners and persists at each setting, but it is unlikely to be noticed. 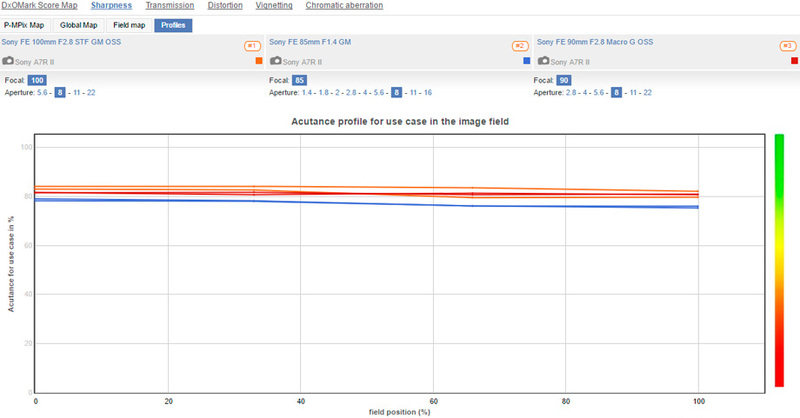 As a modern lens designed for digital sensors, the Sony is very well-corrected for lateral chromatic aberration. It has rather more lateral color at 60% from the image center than it does in the corners (at 100% field position), and it doesn’t change much when stopped down, but then this is usually the easiest type of color fringing to remove using software. Sony isn’t the only lens maker to use apodization filters, but this lens is the only one with a large enough image circle to cover a full-frame (35mm) sensor. As a lens intended primarily for portraiture, it’s fairly limited in use, and at around $1500, it’s quite an investment. Anyone spending that sort of money would also likely consider the 85mm F1.4 GM, even though that lens carries a $300 premium over the STF. Macro lenses like the 90mm F2.8 are often used instead of the more typical high-speed 85mm, due to their useful close focusing ability. The 90mm Macro have slightly higher peak sharpness, slightly lower distortion and lateral chromatic aberration. On the faster models, vignetting is significant when they’re wide-open, but at F5.6/T5.6, it’s too low to have any real bearing on the image quality. 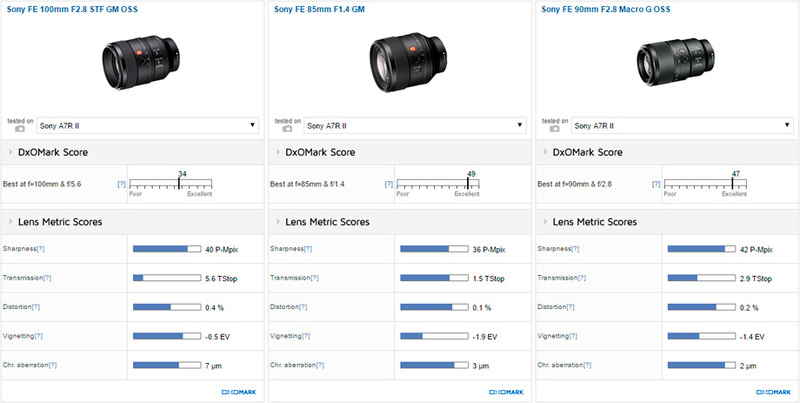 While the use of apodization elements or filters in lenses is no longer a unique proposition, the introduction of this lens for full-frame Sony mirrorless cameras is bound to be treated with some excitement. Even though the lens is somewhat limited by the T5.6 maximum aperture, the inclusion of optical stabilization goes some way toward offsetting that in daylight. 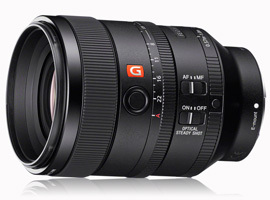 Although we can’t comment on the quality of the lens’s most intriguing quality (the blurring in the out of focus planes), there’s no denying that the Sony FE 100mm F2.8 STF GM OSS has interesting specs and excellent optical quality.